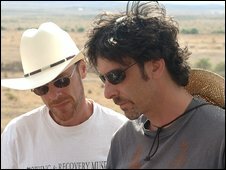 The Coens won the best director Oscar for No Country For Old Men in 2008Film-makers Joel and Ethan Coen have been nominated for a prize at the Writers Guild of America awards for their movie Burn After Reading. The brothers, who scooped an award last year, are up against Woody Allen in the best original screenplay category. Batman film The Dark Knight has been shortlisted in the best adapted screenplay category, alongside British film Slumdog Millionaire. The WGA awards will be handed out on 7 February in New York and Los Angeles. The two ceremonies will take place simultaneously. Last year’s awards dinner was cancelled due to the writers’ strike, with the winners announced in a brief statement. The Coens and Allen – nominated for his latest film Vicky Cristina Barcelona – face competition from Milk, The Visitor and The Wrestler for best original screenplay. The Dark Knight’s screenplay adapters – brothers Christopher and Jonathan Nolan – are shortlisted alongside The Curious Case of Benjamin Button, Doubt and Frost/Nixon. The scripts for all the films were adapted from other sources, with The Dark Knight based on the Batman series from DC Comics. Israeli animation Waltz With Bashir has garnered a nod for best documentary screenplay, adding to its tally of nominations to date. The WGA awards do not include any prizes for acting.